The partition between the Men’s Section and the Women’s Section in my shul has panes of one-way glass in it. With brighter light on one side of the glass it is see-through for the women but to the men it appears as a mirror. I often chuckle to myself as I see men and boys straightening their ties or adjusting their hats in the “mirror” as I imagine some woman on the other side watching the show with amusement. Recently, however, I saw something that not only made me smile, but made me think. A fellow had brought his young daughter, who is perhaps 2 or 3 years old, to shul for Mincha on Shabbos afternoon. As she stood on a chair next to him during the prayers, I noticed her looking in the mirror. I couldn’t pull my gaze away from this adorable sight. She was turning this way and that, smiling at her reflection in the mirror. She removed her headband and carefully put it on her forehead, then slid it back into place at the top of her head so her hair was smoothed down. She tilted her head and smiled again. Then she tore off the headband, decisively brushed her bangs down over her forehead and put the headband back in, this time with the hair hanging to her eyes. She smiled, twisted, and turned back and forth as she admired her appearance. I wondered how at such a young age she had come to this insight of wanting to see what she looked like, and how she determined she looked “good.” It seemed to me that she must have learned it from watching her mother or perhaps an older sister. While she could have figured out on her own what she considers nice-looking, I couldn’t see the preening and posing she was doing coming organically. It made me think about how we are often so concerned with our appearance to others. We wonder what we look like to them, and we are ready to twist ourselves into pretzels for their approval. If that’s your goal: to serve HaShem by being friendly to others, then that’s fine, especially when you’re using your own judgment. If you want to make sure you’re clean and neat, that’s important and admirable too, as you represent Hakadosh Baruch Hu. The problem I find is when the opinions of others become so important that we lose connection to our own decision-making. It’s when we’re willing to pain ourselves and perhaps others in an effort to gain the approval of a chosen few people. 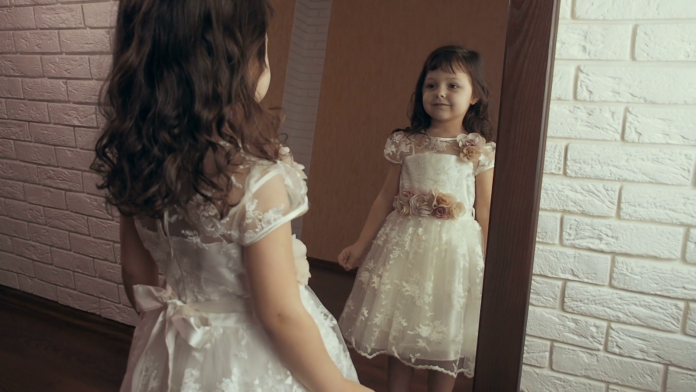 Just as this girl was imitating what she’d seen of people modeling in the mirror ahead of “being seen” by others, we often live our lives the way people on the outside tell us to. This is very dangerous, especially when what society finds “beautiful” is not beautiful in HaShem’s eyes or the eyes of the Torah. Chazal tell us that Yavan, Greece, represents beauty. However, the beauty of the Greeks, who studied Science and created magnificent art, is limited to the body, to nature, and tends to ignore a deeper spiritual element of Man which cannot be overlooked or underestimated – his soul and his connection to his Creator. On Chanukah, we place our Menorahs outside so the world should see what we’re made of. While all the darkness in the world cannot diminish the glow of the Chanukah lights, we must shield them with glass so the winds of the world don’t blow them out. We also light our Menorahs inside on tables by our windows, again, facing the outside world but separated by a glass. Do you know what happens when the lights of Chanukah glow inside and the darkness reigns outside? Those outside can see the light emanating from them and get a glimpse of their true inner beauty as it radiates outward. At the same time, those lights reflect back inwardly – as the glass acts like a mirror. It is at those times, when we gaze at the Chanukah Menorah and strain to see the light of Creation which has been hidden within them (and within the Torah they represent) that we should reflect on what the world is seeing in us, and whether we’re exhibiting the beauty of the Jewish People. When HaShem looks at us, will He be impressed with how we appear? On Chanukah, and every day, we should be putting in all the same effort and more, to twist and turn and scrutinize ourselves to make sure that we’re as beautiful as possible, even if it hurts sometimes or involves pushing ourselves out of our basic comfort zone. However, we should be looking in the mirror not to see how our physical features appears to others, but to ask ourselves if our spiritual beauty is shining through in our actions, words, and behavior. At the end of the day, the thing that matters most is whether HaShem will like what He sees.